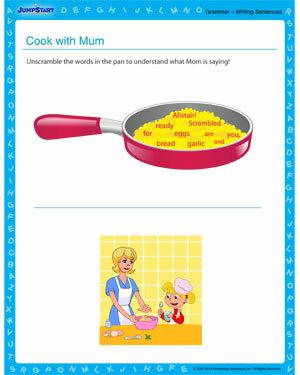 Cook up a lesson in writing sentences with our fun, free grammar worksheet. Arrange the words in their correct order to decipher what Mom is telling Alistair. We bet you’ll crave for a plate of scrambled eggs and warm garlic bread after you’ve solved the worksheet. Download the English worksheet and solve it to find out why!